It’s fair to say it would be hard to run out of places to see while at Turpin Meadow Ranch. Given the large variety of options, we’re launching a new series called “Places to See,” a collection of favorite spots and local attractions to consider adding to your list of area activities. Yellowstone alone is home to approximately 10,000 features. The Fountain Group is a cluster of mud pots and several spectacular geysers in the lower basin area of Yellowstone Park. Located about 10 miles north of Old Faithful on the west side of the Madison-Old Faithful section of the Grand Loop Road, Fountain Flats Drive is an old, two-way freight road within the Fountain Group area that runs behind the Lower and Midway Geyser Basins, and provides easy to moderate access to many sights in the area, including springs, falls, fumaroles sinter formations, and a bit of national parks history. After about three miles, Fountain Flats Drive ends at a parking lot located adjacent to the Sentinel Meadows Trail, a roughly four 4-mile moderate-rated hiking and biking loop which crosses over the Firehole River and services the Sentinel Meadows Group on Sentinel Creek, connecting with trails to the south. The Sentinel Meadows Trail starts with Ojo Caliente, a large and violently boiling hot springs located just across the Firehole River bridge. The trail also passes a geyser, nearby mudpots, and three sinter formations—Flat Cone, The Bulges, and Steep Cone Springs, which are strung through the meadow, as well as a bison dust pit, and a large variety of fumaroles, hot springs, and mudpots. The most famous landmark on the Sentinel Meadows Trail is Queen’s Laundry, also called Red Terrace Spring, in reference to the red-hued cyanobacteria terraces. Queen’s Laundry is located about 1.9 miles west of Fountain Flats Drive on the Sentinel Meadows Trail. It can be difficult to locate, but will be recognizable by the white sinter-soil characteristic of Yellowstone hot springs next to the reddish muddy banks of the springs, and eerie skeletons of trees bleached white by the heat and chemicals of the water and steam from the springs. In 1881, while Yellowstone was being developed for tourists, the second superintendent of the park, Philetus W. Norris, was constructing Fountain Flats Drive and noticed steam rising along Sentinel Creek. The construction crew discovered the large hot springs pool, and at the time, it either had a drainage channel or the water was siphoned into a tub, making it cool enough for bathing (and washing laundry). Dubbed Queen’s Laundry, Norris anticipated that a springs spa would be an attraction for visitors, and constructed a two-room bath house with a sod roof. When Norris left the following year, the structure was never completed. Although a subject of some controversy, the Queen’s Laundry Bathhouse was eventually inducted into the National Register of Historic Places and remains the oldest federally financed structure in Yellowstone and the first built for government use in any national park. As always, when exploring any natural area, it is recommended that visitors stay on established paths. When visiting Yellowstone hot springs such as Queen’s Laundry, which is a lesser-traveled side route of the Sentinel Meadows Trail, it is critical to remain alert and stay away from the springs, which are deadly hot and surrounded by thin layers of soil which may break underfoot. 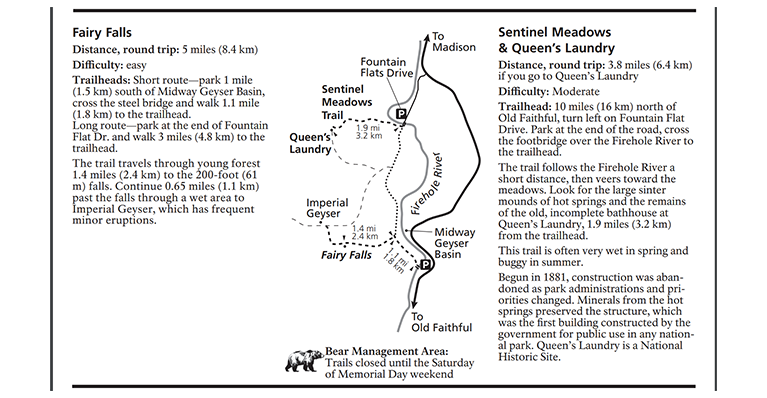 This easy 5-mile trail loop is south of Sentinel Meadows and accessible either by the junction at the south end of Sentinel Meadows Trail, or from the new trail starting at the parking lot one mile south of the Midway Geyser Basin. Located in the east area of the loop, the Imperial Geyser has frequent minor eruptions. Just 1/8 mile east along the Imperial’s largest runoff is the Spray Geyser, which erupts more frequently. 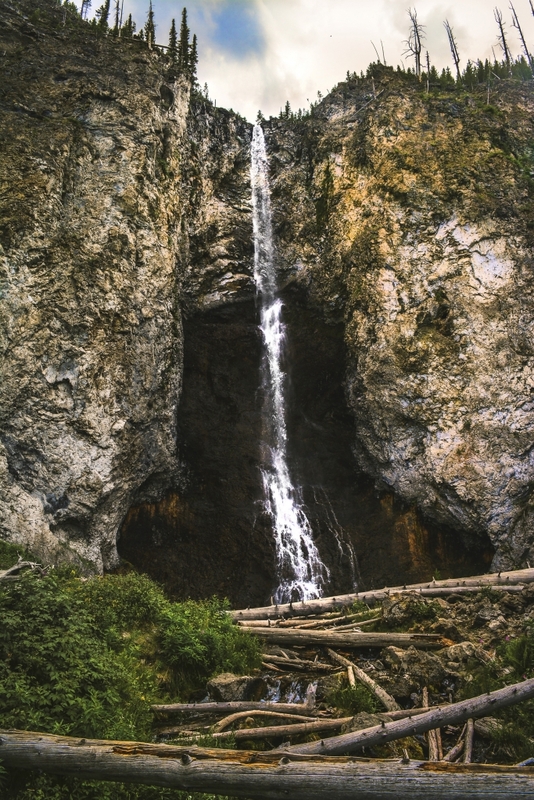 A little south of the Imperial Geyser is Fairy Falls, one of Yellowstone’s most spectacular waterfalls, with a 200-foot high drop of Fairy Creek over the Madison Plateau. This is a Bear Management Area and open only during summer. Areas of the trail might be wet; consider when selecting footwear. Trails subject to insects, including horse flies; bring repellant.